The big preps for this year’s Breeders’ Cup have come and gone. Grade 1 races were going off at the drop of a hat—and that hat was dropping all the time—earlier this month at Belmont Park, Keeneland, and Santa Anita. To us there’s no better month for racing than October with its more predictable and temperate weather. Yet, the three biggest names for the upcoming World Championships were conspicuously missing…and missing not just from races in October—but since Labor Day. Arrogate and Gun Runner are the heavy hitters for the $6 million Classic. Arrogate hasn’t faced the starter since finishing second to stablemate Collected in Del Mar’s $1 Million TVG Pacific Classic (G1) way back on Aug. 19. Gun Runner’s Breeders’ Cup “prep” was the Sept. 2 Woodward Stakes Presented by NYRA Bets (G1) at Saratoga when it was still in season to wear white. The son of Candy Ride has logged four works at Santa Anita in October, but has not been seen on the track past noon since. Stellar Wind, the likely favorite for the Longines Breeders’ Cup Distaff (G1), made her last start a little more than three weeks after the Fourth of July, scoring a neck victory over Vale Dori in Del Mar’s Clement L. Hirsch Stakes (G1) July 30. Since when did Saratoga and Del Mar become “prep” tracks? 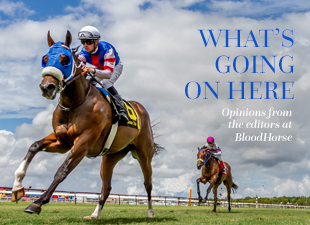 Curious minds and racing secretaries want to know. Racing office teams from Long Island to Long Beach have been throwing their hands in the air, wondering why racing’s biggest names in the handicap and distaff divisions were MIA from “Super Saturdays” designed to get runners ready for the Breeders’ Cup. If they need somebody to blame, pin it on Hall of Fame trainer Bob Baffert as well as sure-fire Hall of Famer Beholder. Baffert has won the last three runnings of the Classic—the last two with 3-year-olds that came to the Breeders’ Cup off runs in the late-August Travers Stakes (G1). Baffert’s 2014 Classic winner, Bayern, though had run 10th in the Travers, bounced back in the Sept. 20 Pennsylvania Derby (G2), then won the Classic six weeks later, the veritable iron horse in the barn. At some point the “one-off” situation turns out to be a trend. As for Beholder, last year Stellar Wind and Beholder went through a knock-down three-race run from the Vanity Mile Stakes (G1) in early June to the Oct. 1 Zenyatta Stakes (G1). While Stellar Wind got the upper hand with two scores to Beholder’s one, Stellar Wind’s trainer John Sadler believes that might have been too much. This year’s he’s also a “less-is-more” type of guy. And the “big one” is the Breeders’ Cup—the event that has turned many of the sport’s marquee races into mere preps. In the last 10 years only two horses have been successful in their final “prep” and the Breeders’ Cup Classic: Curlin, who won the Jockey Club Gold Cup Stakes (G1) and Classic (at Monmouth Park) in 2007 and Mucho Macho Man, who won Santa Anita’s Awesome Again Stakes (G1) and a West Coast-based Classic in 2013. Until a Classic winner can prove to be Mr. or Mrs. October and Mr. or Mrs. November, we predict the current trend will continue.